Bucket Elevator to move material in vertical direction and we have taken care of tensioning arrangement and special design crowned pulley for gripping the bucket belt. We are using casted/fabricated bucket for lift the material. 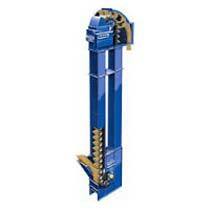 The bucket elevator specially design with rigid construction for its long life. The size and capacity is design as per customer requirement.